The fine folks over at NAL sent me a bonus book with my last happy-package: Last Breath by Rachel Caine. I’ve never read any of the books in the Morganville Vampires series and I don’t normally read YA. So I thought I might give it away to a fan of the series. I only ask that the winner sends a guest review for me to post here, after reading. The review does not have to be positive, just honest. If you don’t like it, just explain why as objectively as you can. If you do like it, tell us why it rocked your world. The contest is open to all Red Hot Books followers in the US and Canada. Last Breath is set for release November 1, 2011. I love you for this!! thank u!! Ooooooo! So excited. Fingers crossed, fingers crossed! This is a great YA vampire series where the vamps are still bad guys and not sparkly or the heroine isn’t overly angsty. Loved the whole series, even as a grown up. Thank you so much for doing this. 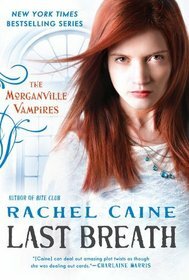 I am a huge fan of Rachel Caine’s and her Morganville series.